Resistance and speed can be adjusted separately for the concentric and eccentric phases, while its real-time feedback monitors the training parameters during exercise. Its many unique features including superimposed vibrations and random perturbations make it a unique tool in a gym or rehabilitation center. Exentrix training data can be recorded in SmartCoach™ software for detailed analysis. Exentrix used for squats, upright row or biceps curl, and custom programmed for "hyperspeed" training with kayak. Video courtesy: NuON Sport/Iberian Sportech, Sevilla. Exentrix is also available in the Portable version, with separate motor and control unit, transportation wheels and a retractable footplate. Switching from one mode to another just requires one click; it is effectively like having many machines in one! 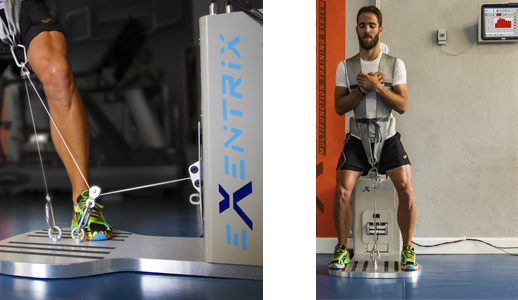 Exentrix allows adjusting the resistance separately for the concentric and eccentric phase. In weight mode, it can simulate lifting and lowering different loads. In isokinetic mode, it permits a different speed for the two phases. That is much more interesting in isoinertial (flywheel) mode, as it allows a lighter inertia (small flywheel) in concentric and heavier (large flywheel) in eccentric, or viceversa. This is obviously impossible to achieve with conventional flywheel devices. With higher eccentric inertia the machine actively returns more energy in the eccentric phase, hence generating true, precisely controlled eccentric overload independent on the execution technique. All the adjustments (load, inertia, speed, etc) can be changed in real-time with one click, even during execution. 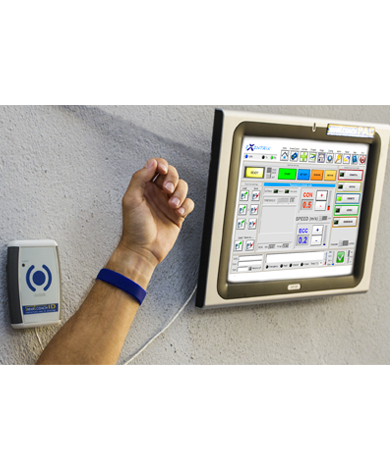 Exentrix software features a real-time feedback which displays the exerted power, force, speed, work or range of motion. The software also comprises a graph function to display and export raw data to Excel, including signals from any external sensor (goniometers, photocells, force sensors, etc). 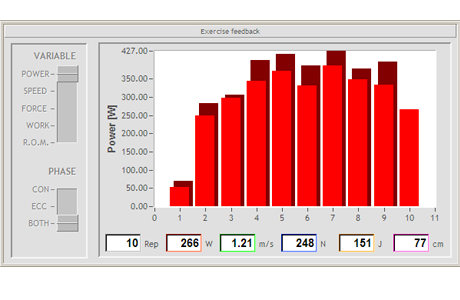 Also, during exercise, Exentrix training data can be automatically fed into the SmartCoach™ database. It is then possible to use the the SmartCoach™ software for analysis and reporting. The range of motion (ROM) can be quickly adjusted in a few clicks and, if desired, saved and recalled along with the other training parameters. A special feature even lets Exentrix acquire the ROM from a sample movement. And if the user-defined ROM is exceeded, Exentrix stops immediately. Some drawbacks of conventional flywheel devices are the time required to change the inertia (e.g., by adding or removing flywheels), and that the range of motion for each exercise needs to be adjusted for each subject, by lenghtening or shortening a strap or rope. In isoinertial mode, Exentrix shows all of its potential: not only the inertia is adjustable (separately for the concentric and eccentric phase) with just one click, but also during the exercise! It is even possible to trim the concentric/eccentric transition, from smooth and slow to fast and reactive. And, even if the range of motion can be adjusted with a few clicks, it’s no longer necessary! With the Force Controlled Recoil (FCR) option, Exentrix auto-adjusts the ROM by sensing the end of the concentric phase and switching to eccentric automatically. In functional exercises, this allows a different range of motion for each repetition. Shock training: in many situational sports each movement is different, and so are external perturbations (tackles, slips, etc). So, what's the point in training with identical repetitions? Exentrix can work as an isokinetic device, i.e. 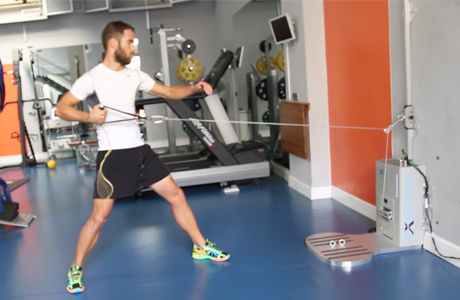 pull and release the rope at constant, adjustable speed regardless of the applied force. 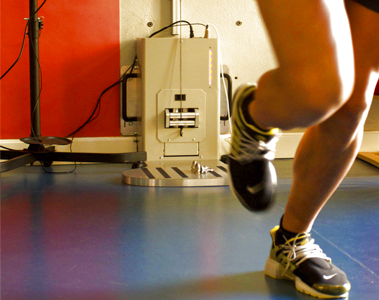 Applications range from rehabilitation at controlled speed, to tests made to assess the subjects’s force-velocity curve. And, unlike much more expensive isokinetic devices, allows training and testing in the same conditions (same device, same biomechanics and identical range of motion). So many features? This is just the beginning. You might have sport- or application-specific needs not covered by Exentrix’s five default operating modes. Examples include mixed training modes (e.g. flywheels in concentric, isokinetic in eccentric), resistance variable with time, joint angle, etc, or even interfacing Exentrix to other devices. This is why Exentrix has four additional, fully customizable training modes (for a total of nine! ), which we can tailor to the customer’s exigences. Customizations are a simple file to upload to the device, and do not require expensive on-site servicing. Customization is also convenient. Training modes developed in collaboration with our customers can be added to our Custom Library Store; whenever a custom mode is sold, the author will be compensated with a royalty. SmartCoach Pro users can also utilize a SmartCoach Pad as a touchscreen interface for Exentrix! The Pad of a SmartCoach Pro system can alternatively be used as a SmartCoach feedback device or as the Exentrix interface. Even more value for the money!